You know when you hear a song and you just can’t place the singer or the guitarist? There’s something familiar but you just can’t think what it is? Such a thing happened to me recently as i was listening to a freebie sampler and stumbled upon a stand out song. 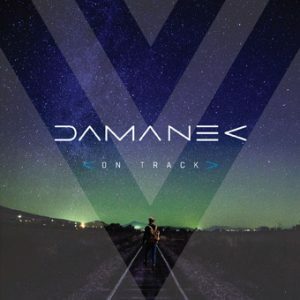 On further investigation i discovered that the up until now unheard of (by me) band Damanek is a melange of musicians known to me and assembled by Yorkshire muso and purveyor of Prog Mr Guy Manning. However, the sound of this début album differs hugely from Guy Manning’s usual format in many ways. 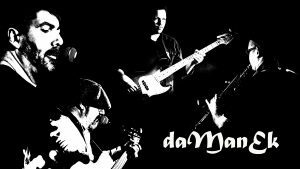 Damanek is an amalgam of three musicians Dan Mash of Mashine on bass, Guy Manning guitar, keys and mandolin and multi-instrmentalist Marek Arnold of Toxic Smile. Though not using his name as part of the bands moniker Australian Keys wizard Sean Timms of Unitopia rounds things off quite nicely. There’s also a myriad of guest musicians involved ensuring this really is a polished and well constructed ensemble of both songs and musicianship. Unlike most other bands and recordings Guy Manning is associated with On Track offers more than Prog complexities and ever changing time signatures. There’s everything from World music, to fusion and ballad as well as the obvious inclusion of the Prog flavourings. Opening song Nanabohzo And The Rainbow really does invoke the feeling of native Americans or ven African tribesman and being out amongst the wild plains and jungle. Rich in percussion and inspiring keyboard sounds Nanabohzo And The Rainbow is a quaint take on the children’s story about Nanabohzo who upon finding the colours of the world in it’s infancy monochromatic and therefore sets about painting the flowers in the colours which we all know them to be with his multicoloured paints aided by the wing tips of birds creating a rainbow. From the outset Sean Timms excellent keyboards and Brody Thomas Green’s tight and powerful drums are wonderfully augmented as are other songs throughout the album by Rim Irrgong of Sothern Empire. Marek Arnold adding a little Arabian atmosphere to the proceedings with his fine clarinet playing was welcome though a little confusing given the subject matter of the song. Staying with an African theme with some rather splendid rhythms is Long Time , Shadow Falls which is the song that drew me to the album in the first place. Emanating a powerful message about the destruction of the rain forest and slaying of wild life the musical picture hangs as if in a frame. As with the first song keyboards, drums and percussion make for a compelling listen whilst Guy Manning’s subtle use of ebow adds to the interesting collage. Here and throughout i can’t help thinking that this is the best i have heard Guy Manning’s voice. This may be down to the production which is second to none or the fact that on this occasion with a different team he seems less hurried, more relaxed and focussed. asily a stand alone piece or single in old parlance. Definately ripe for radio with it’s catchy chorus and melody. With Guy very much in Ian Anderson mode The Cosmic Score gives off a certain Jethro Tull meets electronica vibe. Enlisting my old friend and keyboard wizard Nick Magnus who not only played keys but arranged too, adding some of his magic. The song gives off ambiance and a strange serenity. This is helped in no uncertain way my Marek Arnold’s soothing and smoothing clarinet. Talking of smooth, Believer Redeemer had my ears pricking up despite the protest in the lyrics. This song ticked a lot of boxes for me. Call it pop,funk, fusion or whatever you like i care not a jot. What it is is very good indeed. Show casing Dan Mash’s deft touch on the bass and some great Nile Rogers like guitar licks courtesy of Catling this song shows a different side to Guy Manning a one easily warmed to. The Santucci horns also give a welcome pep to the sound thanks to Alex Taylor on trombone and a trumpet solo by Eric Santucci. Unlike most other albums Guy Manning has been involved with including his own canon of albums under the guise of Manning On Track veers from the path well trodden that is Prog and benefits highly for it. Having said that, more in the traditional Prog style is Oil Over Arabia a personal favourite. Perhaps the most hummed tune of the album at Progmeister towers. Sean Timms keyboards once again terrific as is Marek Arnold’s mesmerising clarinet once again creating the appropriate atmosphere. The closest the album gets to Guy Manning’s solo work is without doubt Big Parade. Set to an jazz band march with added synthesizer makes for and interesting combination though just a little too much protest in the lyrics for me. Big Parade is a welcome interlude to the more serious and to a point intense songs throughout the album. For any parent like myself who witnessed their fledglings fly off into the world Madison Blue will have you reflecting on such heart rendering events. The tale of young people going off into the big bad world to find their wa having flown the nest is nicely captured in this soulful ballad. Stephen Dundon of Molly Bloom adds some delicate flute to this song making it all the more sweeter. Enchanting to say the very least. So, how to conclude such musically pleasing collection of stories? Well, with an even bigger one. Dark Sun taking centre stage here as the lyric suggests presenting a vast soundstage full of so many musical elements. There had to be an epic on board and here it is. laying down a main theme which is as the song title suggest is a little well, err, dark. However, at a little over five minutes in Luke Machin’s powerful guitar sets the pace anew giving way to a cheeky Rhodes and Marek’s wonderful clarinet. A stark warning for the drinking/late night classes, there is some jiggery pokery going on with background voices here more noticeable when listening with headphones. Last word here goes to Luke Machin who’s guitar gets the money shot! An ending that would even make Gilmour’s eye brow raise. Guy Manning’s own considerable body of work this is a more than worthy addition and in my opinion the best work Guy has been involved with. Beautifully packaged, well produced music second to none. Press the button on this one guys, it’s a must have!